We are happy to announce that we are joining over 6,000 libraries and schools by taking part in the Big Library Read program. 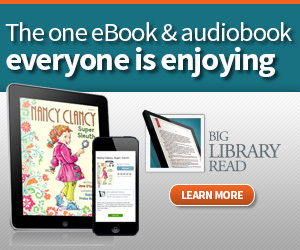 Westchester library card holders will be able to borrow and enjoy eBook and audiobook versions of the Big Library Read book, “Nancy Clancy, Super Sleuth” by Jane O’Connor, from September 16th through September 30th by visiting http://westchester.lib.overdrive.com. Big Library Read is an international program that gives libraries and library patrons unlimited simultaneous access to a popular title for a two-week period, creating a virtual, global book club. Interested patrons will be able borrow Book 1 in the Nancy Clancy series using a valid library card, and enjoy on all major computers and devices, including iPhone®, iPad®, Nook®, Android™ phones and tablets, and Kindle® without worrying about wait lists or holds. Titles will automatically expire at the end of the lending period. There are no late fees! The Big Library Read program is made possible through a partnership between OverDrive, the leading supplier of eBooks and more to libraries, and HarperCollins, publisher of the best-selling Fancy Nancy series of children’s titles. To borrow the eBook and audiobook versions of “Nancy Clancy, Super Sleuth” as part of Big Library Read, patrons can visit http://westchester.lib.overdrive.com.